What do you do with left-over Roast Pork? Well, you can stir fry them with leeks. The combination of slightly saltish Roast Pork with the slightly sweet leek makes this dish very delicious indeed. It is pretty simple really because your only aim whilst cooking this dish is to stir fry the leek till it softens. 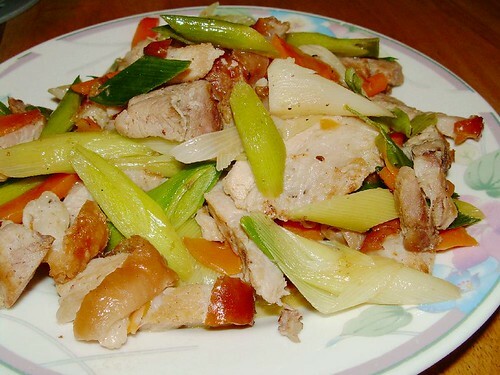 As for taste, the roast pork will give the dish enough “seasoning” on its own, though you can actually add a little bit of oyster sauce for more “kick” out of it. The edible portions of the leek are the white onion base and light green stalk. Cut off the root and cut the leek into not more than 6 cm lengths. Heat oil in wok. Fry garlic for 15 seconds and add leeks and carrot. Stir fry briskly for about 15 seconds. Add the roast pork and seasoning (except chinese cooking wine) followed by 50 ml water. Stir well and bring water / sauce to boil. Close lid and let it continue to cook. Check occasionally to ensure sauce does not dry out. Add more water gradually (not more than 50 ml at a time) and cook till leek is limp and soft enough to your liking. Add chinese cooking wine and stir well prior to dishing out. This dish compliments steamed white rice well. Both the leek and roasted pork are super-flavors! So, in a stir-fry, it becomes superduper flavorful, man! A friend taught me how to make roast pork, but I don’t have the “equipment” to make the pork skin rough. The roast pork at Ranch 99 (the Asian supermarket where I live) has skin that is too hard. Yeanl : Actually, it’s mixed vegetable oil, of which palm oil is a major component. You can also use peanut oil but not sesame or olive oil. The latter two are not suitable for this dish as the aromatics impair the taste. Simcooks: If your roast pork skin is hard you can remedy this by frying the whole slab skin side down in a flat pan or skillet with just enough oil to reach just the skin part. You will need to place some weight to flatten the pork while frying.